I’m always on the lookout for exemplary tossed salad recipes and this one will surely rise to the top of the heap. It’s an especially handy recipe to have up your sleeve before the tender local greens start sprouting from the soil, which need little more than a tart, mustardy vinaigrette to complement their fresh spring flavor. 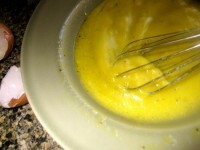 Whisking the coddled egg into the lemon juice and oil. This recipe is from Canlis in Seattle, a classic, much adored restaurant, frankly a reason to visit Seattle in and of itself. I was there 15 years ago with my daughter, and I remember the Canlis salad they served, and how much we enjoyed it. In fact, my daughter has insisted since that the best tossed salad use lemon juice, instead of vinegar, as the acid. Lo and behold that very recipe was recently penned by Sam Sifton in February 28th’s New York Time Sunday magazine. This is a particularly great salad as it’s tremendous flavor profile would be perfect paired with a simple grilled steak, fish fillet or chicken. My changes: I rubbed my wooden salad bowl with garlic clove halves, and made the dressing in the bowl. I tripled the amount of cubed bread to make the croutons and used all of the rendered bacon fat to fry them; I used quartered Campari tomatoes instead of halve cherry tomatoes. I encourage your reading Sam Sifton’s as well as the original recipe, which I only tampered with a bit. Salad hungry, in general? Oh, you’ll be happy here. In a large pan over medium heat, fry bacon until it is almost crisp. Remove and drain on paper towels. Place bread cubes in fat and toss to coat. Toast bread over low heat, occasionally tossing, until bread is crispy. Reserve. Add cold lettuce, scallions, mint, oregano and reserved bacon to the bowl and toss. 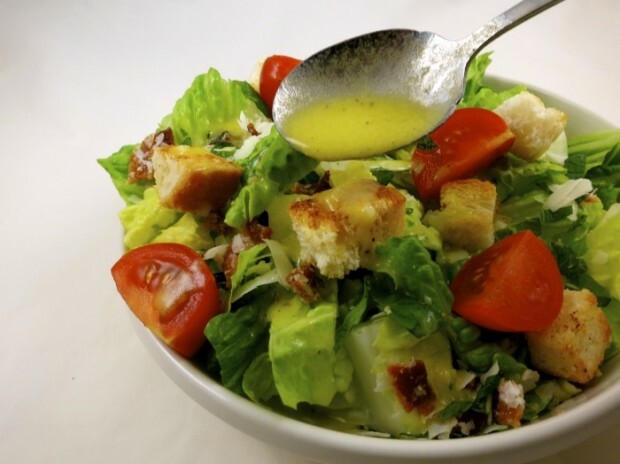 Top with tomatoes, croutons and cheese, toss again, then serve.